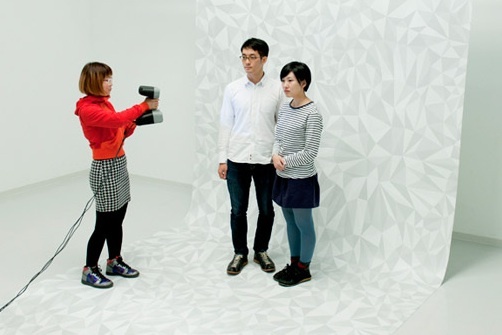 The first 3D printing 'photo booth' that I've ever heard of will be open for a limited time at exhibition space EYE OF GYRE in Harajuku, Japan. Be sure to make a reservation, because instead of a cheesy picture, you will receive a miniature replica of yourself! The process appears to have three steps: 1) scan all over with a hand-held scanner, 2) choose hair color, texture of clothes, etc. and 3) the 3D printer creates the output. I can't think of an exact duplicate (!) for this idea in science fiction, but I'll bet readers can do better. However, in the meantime, consider the planetary biometric identification program of the Iszic, intensely secretive intellectual property fanatics from Jack Vance's 1954 novel The Houses of Iszm. At the spaceport, all visitors must submit to a detailed scanning by feeler-planes that were so sensitive that the resulting three-dimensional simulacrum had accurate fingerprints. Via Kurzweil AI; don't miss the Omote3D website.